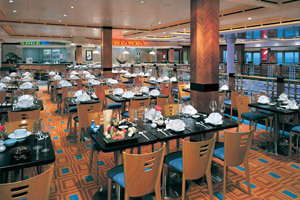 Norwegian Star features a wonderful variety of cruises. Among the possible cruise destinations are Alaska, the Mexican Riviera and Panama Canal. This 90,000+-ton cruise ship is a perfect choice for cruisers of all needs and desires, as she has 13 dining choices, a variety of accommodations to choose from, fabulous entertainment options and much more! 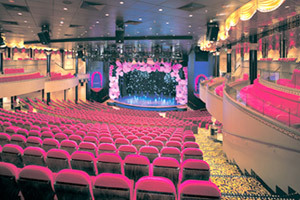 During 2010, Norwegian Star received a variety of enhancements during a two-week dry-dock. Cosmetic enhancements were done, as the ship received new carpets, wall coverings, and upholstery, as well as flat-screen TVs in all staterooms. 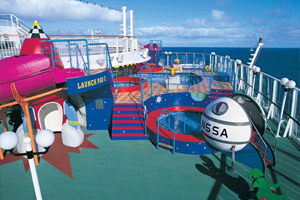 Improvements were also made to the Kid's Crew and Teen's Crew areas, so that parents can be sure their children are having fun. 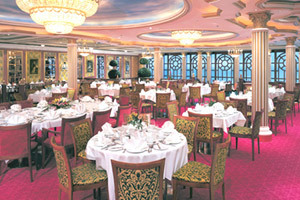 The casino was reconfigured, and there were 54 staterooms added to the ship. The staterooms on board Norwegian Star range in size from 142 to over 5,000 square feet in size, depending on the type of accommodations you're interested in. Options available on this ship are insides, ocean views, balconies, mini-suites, suites and even a couple of luxurious Garden Villas. 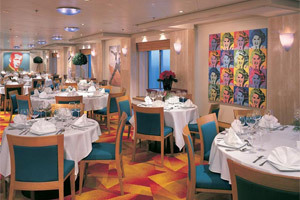 Among the dining choices on a Norwegian Star cruise are 24-hour room service, the main dining rooms (Aqua and Versailles), Blue Lagoon (a good place to have a midnight snack) a buffet, and a bunch of optional specialty restaurants. Some of the specialty restaurants are Cagney's Steakhouse, Le Bistro (a French restaurant) and Ginza (an Asian restaurant with a sushi bar). As far as entertainment and activities go, there's plenty to do on board Norwegian Star. For instance, Stardust Theater is a three-level venue that features live performances during each evening, such as Broadway-style production shows, comedians, musicians, singers and dancers. Also on board this cruise ship is a casino, spa, fitness center, basketball/volleyball court, golf driving nets, teen club, video arcade, swimming pools, hot tubs, internet cafe, wine cellar and more! 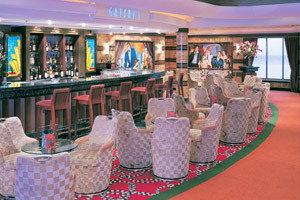 Accommodating 371-guests, this casino is a popular place to be on board Norwegian Star. If you're feeling lucky, give it a shot! Among the games available are blackjack, poker, roulette, slot machines and craps. If you'd really like to pamper yourself, go to Norwegian Star's relaxing spa and enjoy (at least) one of the many treatments available. Some of the treatments are facials, massages, body wraps and acupuncture. If you'd like to exercise, there's a fitness center in this area with state-of-the-art equipment and a bunch of aerobics classes. If you're used to having the best of the best, you should absolutely consider booking a Norwegian Star cruise in one of the most exclusive accommodations at sea. These ultra-luxurious villas are over 5,000-square feet in size! Both of the massive Garden Villas aboard Norwegian Star come with butler and concierge service, as well as a private courtyard that features a garden, hot tub, outdoor dining area and terrace. 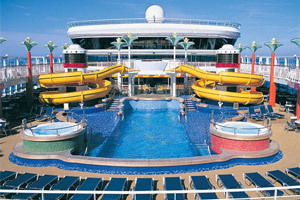 Low Price Guarantee on all Norwegian Star Cruises! Book any Norwegian Star cruise with us and you'll get the best deal possible, regardless of the ship or sail date! 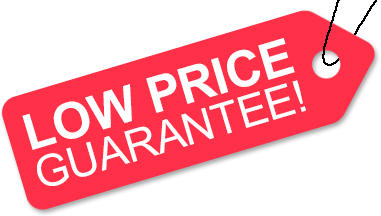 Because of our "Low Price Guarantee," nobody beats our Norwegian Star cruise prices, so look around and you're sure to find the best NCL cruise deal possible when booking with us! Pre-Paid Gratuities on Norwegian Star Cruises! Get an Onboard Credit when you book a Norwegian Star cruise with us. The value of the Onboard Credit depends on the particular cruise and accommodations you book. Onboard Credit values are listed on Step 3 of the online booking process. We do not charge booking fees on any cruises! You're sure to enjoy an affordable Norwegian Star cruise when booking with us! Military Discounts on Norwegian Star Cruises! We have very special NCL cruise pricing available for active and retired/veteran members of the U.S. and Canadian militaries. Our military discount is available over the phone or online - book your Norwegian Star cruise with us to save! Promotion details are displayed during the online booking process. Certain restrictions apply. Our special offers on Norwegian Star cruises may not be combinable. Certain restrictions apply to each offer. View terms and conditions during the online booking process. Click a price below to view the Norwegian Star cruises during that month in that destination.